The green bean bag chair was critical. Without it, there would be nothing separating his head from the pavement. As he laid on his back, this was more a matter of comfort, but as he began to ascend feet first into the sky, it became a matter of life or death. That is, until his head passed the 6 foot mark, then it was reduced to a mere punchline. A ballistic descent from that height coupled with his inability to use his arms or legs to break his fall would most certainly have been fatal. I pretended not to know that. About a year earlier, Wayne, who was 16 at the time, and I began researching straight-jackets. We knew where we could get ‘special’ straight-jackets that facilitated escape, but we were determined to settle for nothing less than authentic straight-jackets that were designed and manufactured to restrain violent individuals that did not want to be restrained. After dozens of phone calls – most of which were quite awkward – to retailers, medical supply companies, law enforcement agencies, and detention facilities, we finally found a place that would supply us a bona fide straight-jacket that had numerous features to prevent escape, and no features that would make escape possible. Mastering the straight-jacket escape was not easy. At times it seemed like it might be impossible. Wayne spent hours being trussed up and confined. He was smart enough not to leave the task of binding him to the faint of heart. He had myself or his high-school buddies put him in the jacket and secure it with all of the force we could muster. It was not a smooth learning experience, nor was the learning process easy for those of us that had to observe him, unable to help or ease the pain. The straight-jacket brought pain, soreness, and bruises, but on the plus side there was less blood than there was when he was learning to escape from handcuffs. After developing the skill necessary to escape from the straight-jacket, Wayne began performing the escape as part of his performances. He would stand on the stage or in the middle of the room and invite the biggest, strongest volunteers in the audience to fasten the heavy straps. While he sometimes struggled more than usual, he could reliably get out of the straight-jacket, on the ground and right-side up. Something had to change. So I bought some lumber and screws and built, for want of a better word, a gallows in our backyard. We did more research to find secure bindings that could be used to hoist his feet into the air and suspend him as he relearned how to get out of a straight-jacket. It’s much different when there is no leverage and when gravity reshapes your body and completely alters the fit of the jacket. Hanging upside down in a straight-jacket is also a mind altering experience. Not only is your perception thrown off, but blood flow to the brain, by virtue of gravity alone, increases and alters the physiology of the brain and head in potentially dangerous ways. We played with different materials, different knots, different strategies until we came up with a rig that we could trust. Even though his head was barely a foot off the ground during these trials, the arrangement was adequate and allowed him to train for something bigger. E ventually, we were comfortable that he could reliably escape while suspended in the air by his feet. He began talking to the Downtown Chico Business Association, with whom he had been working for 3 or 4 years. 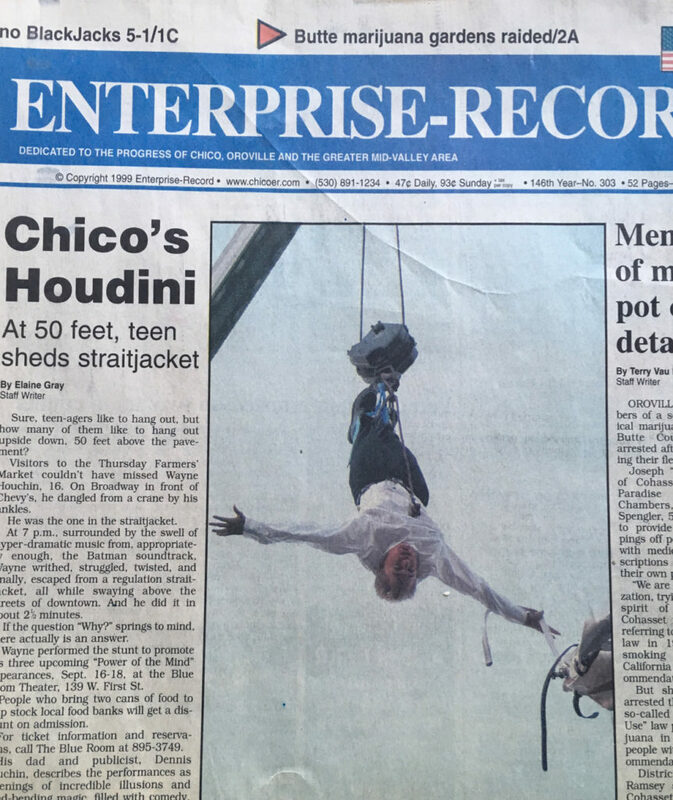 They agreed to allow him to do an escape while hanging from a crane in front of a historic building in Downtown Chico. From a crane? Where do you get a crane? How do you operate it? So… more research. We found a crane, then we found a driver. But who would we get to operate it? Who would take the risk of hoisting someone elses child 60 ft into the air by their feet to do a dangerous stunt? Nobody sane. So I learned how to operate the crane. Wayne and I went to an undisclosed location to practice all aspects of the stunt. As reckless as it may have seemed, safety was always our first concern. Everything was meticulously planned out and we eliminated as much risk as possible. Seventeen years ago today, I stood at the controls of that crane in front of a crowd of thousands that had gathered around and began lifting Wayne into the air. Despite the planning, my confidence in our testing and preparation, and despite the confidence I appeared to have on that day, I was terrified more than at any other time in my life. Four minutes later, Wayne was safely back on the ground standing with myself, his mother, brother, sister and friends that were there to support him. I was so proud of Wayne at that moment. knowing that what he had just accomplished would virtually guarantee that he would never see any challenge that life had to throw at him as something more than he could handle. But my joy at his accomplishment was overshadowed by the prayers of gratitude for his safe return to terra firma that I offered up on that day. The events of the year leading up to September 9th, 1999 were connected by a bright thread. A thread that, in fact, had been running through my life, and through the lives of my wife and my children: Kristina, Richard, and my oldest son, Wayne. A thread that had been spun from hope, faith, love, a strong work ethic and a commitment to achieving those things that were important to us, despite the fact that others may have thought them to be impossible. As much as any rigging that we had created, on that day, for those moments, Wayne was hanging by this thread of achievement and accomplishment. 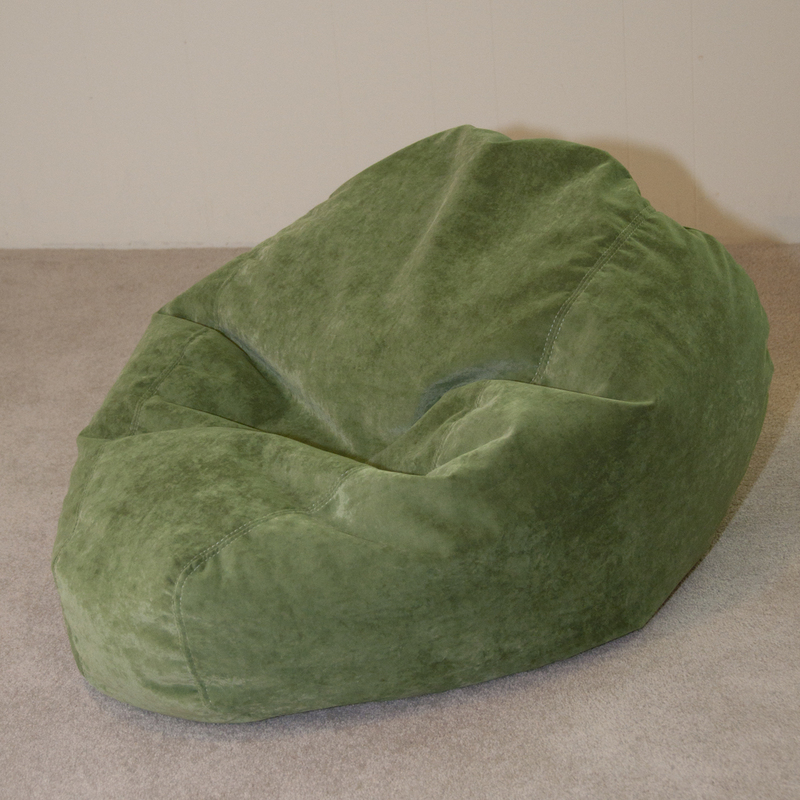 So the green bean bag chair did it’s job quite well that day. It kept his head and shoulders off the ground while getting connected and unconnected from the rigging, and served as a great punchline for years to come. Today, I quietly celebrate the anniversary of this achievement when both Wayne and I moved through our doubts and fears and achieved what many thought to be impossible, all while hanging by a thread.